Sometimes, a conservative look is needed or preferred. Wahl clippers let you have fun and be all business at the same time. Using your Wahl clipper, select an attachment guard that will shorten the hair but not leave it too short. Number 5 is a frequent selection. If you find that the hair should be cut shorter after the first or second pass, change to a lower numbered attachment guard. Using an upward, rocking motion, cut around the ear and then continue to the back of the head, all the way to the other ear. Comb the hair as you go. It will give you a better idea of how the hair naturally lies. Switch to a higher attachment guard (a number 8 works well) for the top of the head. From the back, comb the hair to see how it naturally falls. Begin to cut, rolling the clipper from front to back to help cut down on bulk. Now blend the sides, using the rolling technique over the ridge of the head where the sides meet the top. 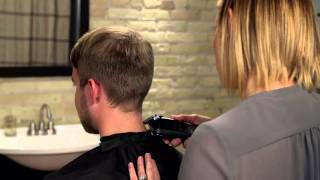 Using your Wahl trimmer or the inverted clipper technique, trim the neckline and arches. For detailing around the ears, sideburns and neckline, try the inverted clipper technique. Just turn the clipper upside down so the blade is facing downward. Hold the clipper in your hand as if it is a thick pencil. Touch the blade to the skin. There’s no need to press firmly.